It’s a moot point as to whether a collectible miniature of a fantasy creation is actually a ‘scale model’. 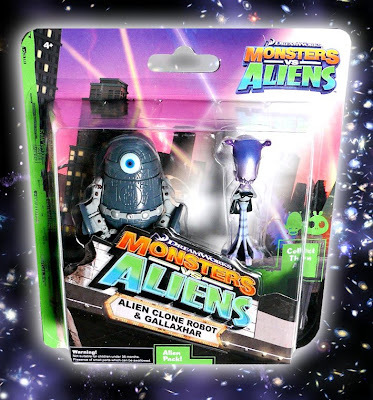 In the case of the movie ‘Monsters vs Aliens’, the originals are Computer Generated Images (CGI), so in a sense collectibles in the stores are more ‘real’ than the source material. Still, that’s one for philosophers - what’s more important is that the movie ‘Monsters vs Aliens’ is well made and huge fun. And so are the many collectibles currently flooding the supermarkets and toy stores. This pair, priced around the £5.00 GBP ($7.50 USD) mark, show the Alien Clone Robot and the evil alien overlord Gallaxhar. The pack makes them look much bigger than they are of course, but that’s typical of marketing techniques in the toy market. Collectors probably won’t want to damage the ‘Alien Pack’, but the rest of us can open it up and place two nicely detailed models, each nearly 60 mm high, on the shelf. As for me, my robot collection has just gained another member. The Monsters vs Aliens movie site is here, and all sorts of stuff relating to the movie is available from Amazon here.